Las Vegas, March 28, 2017: Futurecom Systems Group, ULC today announced the latest addition to their RF coverage solution portfolio, the PDR8000 - Portable Digital Repeater. Designed for Federal or other public safety agencies whose duties extend beyond traditional fixed RF coverage areas, the PDR8000 provides local on-scene P25 coverage and a V.24 wireline connection allowing connectivity to Motorola Solutions Inc. dispatch consoles anywhere in the world. The PDR8000 was built with special ops and security detail teams in mind, with a lightweight transportable case weighting less than 28 lbs. and is suited for discreet travel. "Our Federal customers are required to operate anywhere, anytime to provide for our security. They need reliable, secure RF coverage. Futurecom’s PDR8000 gives them the ability to rapidly deploy P25 compliant local RF coverage with connectivity back to command and control dispatch. The PDR8000 rounds out Futurecom’s portfolio, which includes the DVRS and VRX1000 product lines, to allow first responders and security agencies to bring the RF coverage they need, where ever that may be.” said Paul Halinaty, Futurecom President & CEO. Futurecom will be showcasing the PDR8000 portable digital repeater at the International Wireless Communications Expo in Las Vegas, NV. Booth #1524 from March 29-30th, 2017. The PDR8000 portable repeater will be shipping in Q2 2017 and will be sold exclusively through Motorola Solutions Inc. worldwide. Headquartered in Concord, ON, Futurecom Systems Group, ULC is a leader in the design and manufacture of RF coverage extension products for public safety customers. Futurecom’s customers include major radio equipment OEMs, public safety users, utilities, integrators and two-way radio dealers. Futurecom is owned by McWane Inc., a family-owned business located in Birmingham, AL. 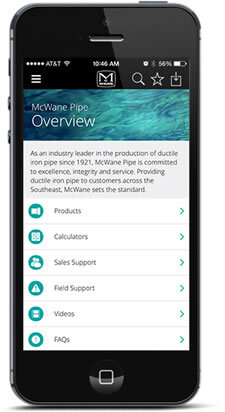 McWane is one of the world's largest manufacturers of iron water works and plumbing products, and one of America's largest privately owned companies.